What is Maundy Thursday? Maundy, meaning "mandate", a new commandment, also known as Holy Thursday—Christians celebrate Holy Communion. On this night, many years ago, Jesus shared his Last Supper with his disciples. He also instituted, for all time, a meal to carry us through until we drink and eat with him in heaven. That meal is known as Communion, Lord's Supper, and/or the Eucharist. On this night we remember Jesus and look to him in true faith. Come join us for an intimate time of fellowship and obedience to Jesus, on this most Holy Night. A Service of Tenebrae, or "Darkness", is an extended meditation on the passion of Jesus Christ. As we read, meditate, and extinguish candles, it becomes a powerful reminder of the cross, the cost of reconciliation, and Jesus our Lord. Worship with us on this most holy day. On this day we remember Jesus resting in the tomb on the Sabbath. The Easter egg, for Christians, is a reminder that Jesus doesn't remain in the grave! The egg resembles the stone of the tomb and the hidden life inside. The egg points to the tomb in which he rested and the eternal life hidden inside! Contact Crystal Bell for volunteer information. Please let Crystal know who is calling if leaving a phone message or texting, Thank You. Join us as we celebrate the resurrection of Jesus! From that first Sunday, to this Sunday, there have been witnesses gathering to remember, and rejoice, that death was defeated! The first Christian act of worship was on Sunday morning when Christ rose from the dead. Christians have met every single Sunday morning since. All over the world each morning, Christians wake up to go worship the risen King! Come join us as we celebrate the cornerstone of our faith—the resurrection! There is new life in Jesus. A new start! Come join the festivities with us at Harvest Pointe. Click Button below to sign up! Lent, Old English for spring, is a spring cleaning for the soul. During Lent we observe 40 days of fasting and prayer. Like a good spring cleaning, some things in our life need to be thrown out, swept away, or cleansed. The beginning of Lent is known as Ash Wednesday. We will observe the beginning of Lent with the imposition of ashes and communion. Come join us for a special service of communion on this holy night. Bring your family and friends as we worship the newborn King! We'll start at 6 PM. Join us on December 1 and help decorate our sanctuary for the start of the Advent season. All are welcome! Contact Frank Arena or the church office for more information. Harvest Pointe invites you to join us as we celebrate the birth of Jesus! December is a time of giving. Jesus said that it is more blessed to give than to receive (Acts 20:35). We believe that. 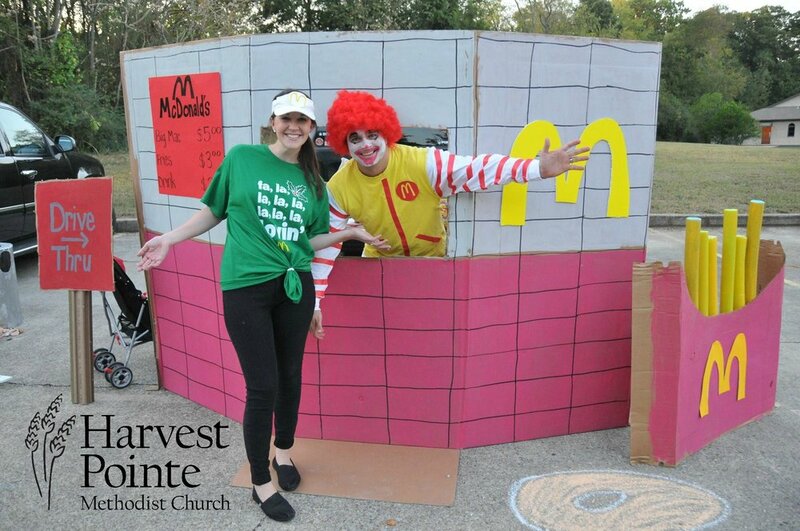 Harvest Pointe has a bounty of ministry opportunities this month. Check out our website~Missions Tab~ for more information on how to give more than we receive. Harvest Pointe is excited to participate in decorating a tree for downtown Madison this year! Join us! November 28th and help us decorate! Contact Lindsey May for additional information. Harvest Pointe will once again participate in Prison Fellowship's Angel Tree program. We will purchase and deliver gifts for children who have an incarcerated parent, on behalf of that absent parent. This is an important outreach, helping families in very difficult situations; but it is also an opportunity to share with them the love of Jesus. We need your help! Starting on Sunday, November 25, there will be an "Angel Tree" at the rear of our Sanctuary for you to choose a child to help. Gifts are to not exceed $20, and must be returned by Sunday, December 16. For an extra blessing, you may wish to sign-up to deliver gifts during Christmas week! For more info, contact the church. Come join us for a time of fellowship and thanksgiving! We will be having a potluck dinner at Harvest Pointe. Click the button below to sign up and participate. Can a shoebox gift really change a life? We think so! Samaritan's Purse knows so! Harvest Pointe is joining a nationwide effort to bless the children of the world and send Good News with great joy! The boxes can be dropped off at our church location November 4 and 11. On Sunday, November 11, we are going to lay hands on those boxes and pray as a church that God would impact the world with his love and our giving. Come join us in this mission! For more information, click on the "Get Started" button below or contact us at the church. If your child is participating in this year’s program please commit to attending practice. Preparation is so important and helps our HP Kids feel comfortable. For more information about the HP Kids Christmas program please contact April Blaylock. Harvest Pointe will be hosting our annual Trunk or Treat at 103 Gin Oaks Court; Madison, AL. We'll start at 5 PM on Saturday, October 27, and go to 7 PM. You're invited to join us for a free time of family, fall, and fun! All in a safe environment for all ages at one location. For more information, contact us at 256.434.1390. Join us as we come alongside others to Serve the City as One! Please be sure to sign up. For more info on what Harvest Pointe will be participating in particularly, contact Jack and Kerry, jkpmlawrence@bellsouth.net. Join us at 10am as we celebrate Jesus' birthday! We'll have a family worship service that'll engage ALL who come. It's going to be a special day of worship! Bring your family and friends and worship with us! Join us for a special Christmas program put on by our HP Kids! As part of our worship on this day, the kids will be presenting a Christmas play—A Tree Lot. Wear your favorite Christmas sweater or Christmas colored outfit and join in with the worship, fun, and fellowship. Contact April Blaylock for more information about the Christmas Program, ablaylock80@gmail.com. We are having a special act of worship on December 17th—our Manger Offering! This is a unique year-end giving opportunity, above and beyond our normal giving. During Christmas we celebrate God giving us His Son; the greatest gift. This was a sacrificial gift, and on this Sunday we practice that same generosity by giving sacrificially. Come join us on this unique day as we give a gift to Jesus! Bring your gift—no matter the size—and place it in the manger as you remember God's gift to us. EVERYTHING given in the manger offering goes to help fulfill a need outside of Harvest Pointe. Join us! Harvest Pointe will be caroling on December 15th at the Charleston Oaks Apartment complex. What a wonderful way to spread God's love through song. Contact Lindsey May for more information. Come join us for a time of fellowship and fun at our annual Adult Christmas party. We're making it easy again this year. There'll be NO gift buying and we are planning to have hot drinks and our favorite Christmas candies, along with some directed activities to help engender community in our church. If you can, please sign up to bring one or the other, here. Child care for three and under will be provided at the church. For more information please contact the church. You're invited to join us for our annual Friendsgiving celebration on Wednesday, 15 November at 6 PM. This is a time of church fellowship and thanksgiving. For more information, contact the church. Click the Meal Train link to sign up!